When it comes to eating, we have found that our chickens will try anything once, your toes, fingers, hair, buttons, infact anything small enough to fit in their beaks, and more often than not, pieces of bread that are far too big to fit into their beaks, but they’ll try anyway. Since getting our chickens we have mainly fed them with layer pellets, as they were raised on pellets at the farm where we bought them. Occasionally when the supermarket has run out of pellets, we buy layer mash, which is a bit like porridge mix, you add water and stir it up, we use a bucket, the girls seem to enjoy the change from pellets, my partner told me that one of her pupils, who’s family also keep chickens, said that her parents are mixing up the mash with hot water (as it’s winter here), and it has increased their hens egg output. 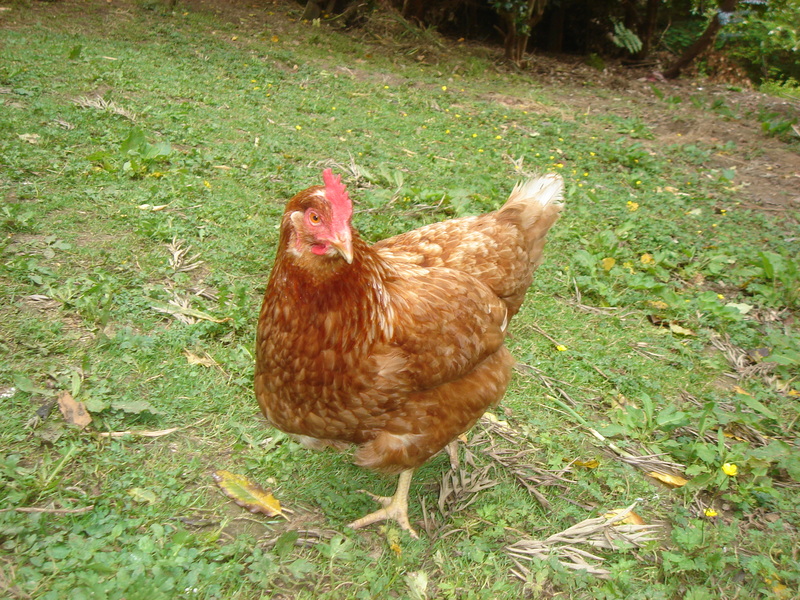 One important factor when choosing a feed, is to check whether it contains grit, or shell, which is essential for the chickens diet, it helps with forming the egg shell, lack of calcium will cause soft shelled eggs, some pellets have the shell included the the pellet, other manufactures place a small bag of crushed oyster shell in with the pellets, or alternatively you can but it from most pet shops. I always try to bring a few shells from any beaches we visit, I put in them in a plastic bag, place them on a hard surface and smash them up with a hammer, do this at home, as it looks strange at the beach. Other suppliments to the hens diet come from the garden, in the form of bugs and grasses, some plants and weeds, they have really helped keep the weeds down the the back garden, we also throw our food scraps on the compost heap, and they will rake through those and pick out any good bits. A bit of varity is the main thing when it comes to chicken feed, it makes them healthier, both in body and mind, they get bored with the same food everyday. Hello keepers, not much to report so far this week, no projects on the go, although I did aquire a small fence, from a job I did earlier in the week, so I imagine that will be going up somewhere soon, just trying to figure out the best spot for it. The main thing I have noticed about the girls this week, is that after their party food had ran out, of course we went back to buying feed, they have mainly been fed layer pellets, from several suppliers, they have turned their beaks up at the budget pellets before. Well we had swapped them onto mash, the week before the party, so they had been used to moist food for a couple of weeks, unfortunatly the two shops we tried were sold out of mash, so we bought them the midrange layer pellets again, well it wasn’t good enough, although they were hungry, as they had been complaining for a half an hour before I went to the shop, when I delivered pellets to their feeding trough, they had a look, tried a couple, gagged a bit on them, like P.O.W’s from an old film, then took themselves off to bed, moaning about the dry food. I don’t know some birds just aren’t grateful. Daphne, our speachless shaver, Darthne has become her nick name. Hi there, as you may have read earlier, we have 3 new chicks, and the breeder we bought them from gave us enough feed to last them a day, which was very kind of her. So today i had to get some chick feed with the added avirix or someting to help the chicks immune system, also I have heard good things about a laying pellets called PECK N LAY, comes with a bag a grit too, however the nearest supplier to me for those items is 26kms away, so thats a 52km round trip. Bearing that in mind, when I got to the store, I found that the pellets are $6 dearer than I get in town, so I asked politely if a discount was available, well you’d think i’d asked for the crown jewels, by the reaction of the teller.’ What for!’ she asked bemused, I explained how a simular product sold in the shop near me was $6 cheaper, and how I’d driven 26km to get there, implying that I won’t be coming back unless you make it worth my while, still no was the answer, something to do with small margins. On the way out of the shop. I notice someone grabbing a couple of big plastic drums from the yard, that had been previously used to transport some form of chemicals, I asked the other shop keeper if they were free for removal, $30 was the reply, ‘ oh ok’ i said walking back towards my car, to which the little old lady who was with the man buying 2 drums, remarked ‘ He wants 1 doesn’t want to pay fot it!’ thought she had said it out of my ear shot, but i turned on my heals and replied, in a polite way, ‘ I recycle other people rubbish for them, and make new things for others rather than waste new materials’, to which there was just silence, then her husband I presume, informed me I might get 1 on trademe ( New Zealand’s trading site), the shop keeper than pointed at a load of pallets I could take, which I promptly did. A new item will emerge from the old pallets.